If you are thinking of planning to visit any of the national parks, I'd like to suggest Arches National Park in eastern Utah. Arches National Park is a treasure trove of otherworldly sites. There are more than 2,000 red-colored sandstone spires and massive arches within the park's 76,679 acres. Hundreds of websites can instruct you on how best to "do" the park — which arches to see first; what times are best for photography purposes; or which hikes are hard or easy. I'd like to share with you why to go. I've been through the park twice, allowing a full day each time to explore. The first time I went, my friends had opted for a canyoneering day. I was recovering from an ankle injury, so I decided to do Arches on my own. Once through the park's main gates, there is a steep and winding incline that leads to a terrain that will amaze visitors on many levels. I thought this day trip was going to be purely a "check the arches off the list" kind of day, taking the appropriate selfies in front of the popular and noteworthy arches. The park, it seems, had other ideas. My first stop was simply alongside the completely vacant road in the early morning stillness. There was not a soul on the road in either direction, giving me a prime photo opportunity. I looked around and the first thing that struck me was the coolness of the air on my skin as I walked in the shade. Then, I noticed the absolute silence completely surrounding me. In the stillness of that moment, I also caught the sweet freshness of the high desert air. I hadn't even hiked to an arch and the park was already treating me to some of the secret magic of this place for those willing to slow down and experience it. I did hike most of the sections of the park that day, but one small and uneventful hike to a lesser known arch ended up holding the most memorable moments for me. 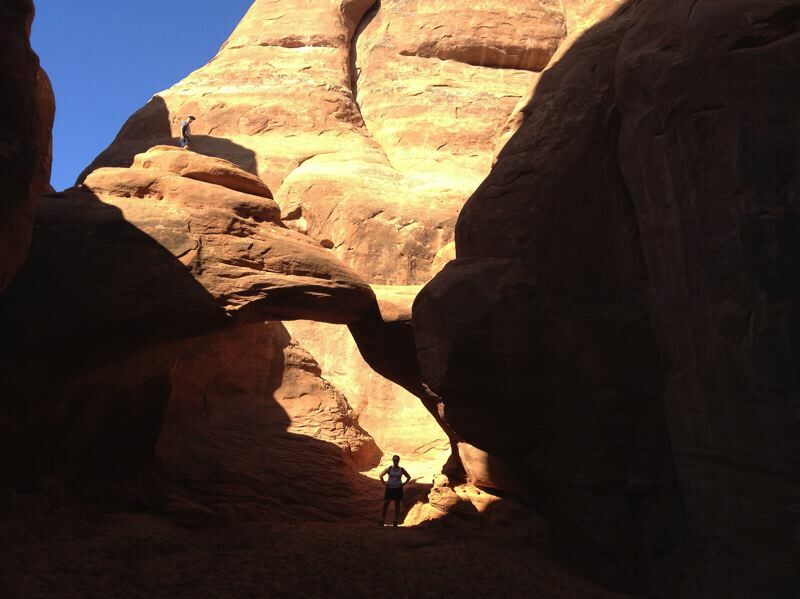 I parked at the trailhead that leads to the Sandstone Arch and further on, the Broken Arch. The easy stroll to Sandstone Arch turned out the be the gem of the day. A grassy trail gave way to a mix of sand and scrub, leading me to what seemed like a secret passage through tall and narrow sandstone spires. I could actually smell the dampness of the sand in the coolness of the shade. As I steadied myself on either side of the narrow path, my hands got to feel the dichotomy in the textures of the spires. I was surprised at how both smoothness and sandiness can exist in the same touch. After emerging into the open area behind the spires, the actual Sandstone Arch is modest compared to the other arches in the park. For me, it held some of the best experiences the park had to offer by engaging all my senses in the getting to it and seeing it. If the excitement and curiosity of the arches is what gets you to Arches National Park, make sure you slow down enough to discover some of its more subtle delights that involve all of your senses. This is why the park is so much more than just a bunch of arches. To see what Arches National Park has to offer, visit www.nps.gov/arch/index.htm. Lila Reed has traveled to 30 US states and nine countries. She is also a business and resort secret shopper and has 30 years of experience as a business owner. Follow her travels at www.magicmomenttravel.com.